Hall of the Mountain King: Review: Gloryhammer, "Space 1992: Rise of the Chaos Wizards"
On their latest Space 1992: Rise of the Chaos Wizards, due September 25 from Napalm Records, Bowes and Co. take us into “the distant future of the year 1992,” where Zargothrax has been freed from a frozen prison and now threatens not only Dundee and the world, but the entire universe. It’s up to a descendant of Angus McFife (the 13th of his name) to take the battle against Zargothrax into space. It’s even more outlandish than the first storyline, but Christopher Bowes weaves his evil spell through more melodies that you just can’t forget. Even songs that aren’t my favorites when they’re playing, like “Victorious Eagle Warfare,” I find worming their way back into my head a bit later. Bowes introduces us to the space theme on opener “Infernus Ad Astra,” where he delivers a line introducing the time frame and informing us “war has returned to the galaxy,” followed by a brief soaring fanfare that would be just as at home in an epic fantasy movie as a science fiction adventure. That leads us to the first single and title track “Rise of the Chaos Wizards.” Though not initially as infectious as “Angus McFife” from the last album, it’s a driving tune with some symphonic/operatic elements and a chorus that’s been running around in my head for the last week. More importantly, it gets the thumbs up from my 10-year-old son, who has spent a lot of time singing along to “Angus McFife” with me over the past couple of years. The beauty of Gloryhammer lies in the fact that they embrace the inherent cheesiness of the power metal genre and play it to the hilt. There’s a tongue-in-cheek slyness in the way they deliver a completely over-the-top composition like the made for a Dungeons & Dragons soundtrack chorus of “Legend of the Astral Hammer” with emphatic power and sincerity. Though there’s certainly a great deal of humor in what they do, they take the music very seriously. 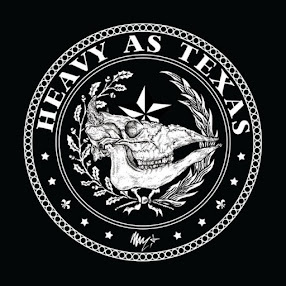 The songs here, as on their first record, are superior examples of the genre, better than many bands that take themselves far more seriously. 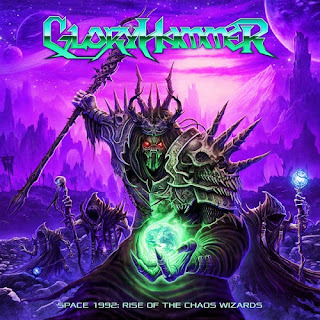 Gloryhammer offers a nod to 1980s metal on “The Hollywood Hootsman,” while at the same time not straying too far from the epic, symphonic sound they’ve employed to that point. It’s also probably the song with the most similarities to the Alestorm sound. There’s another 1980s nod on the synth heavy “Universe on Fire,” which features almost a dance beat. It sounds like that inevitable corny inspiration song that had to come at some point in every mid-1980s movie. It’s simultaneously out of place and perfect for this set of tunes. The symphonic sound gets ramped up on “Questlords of Inverness Ride to the Galactic Fortress!,” a song most worthy of the exclamation point that ends the title. I mean, you’ve got space unicorns leading mighty warriors to a fortress that holds the secrets of the universe. How can you not end it with an exclamation point? And what’s a power metal album without that grand, sweeping epic battle song? “Heroes (of Dundee)” brings that, opening with a symphonic build-up to a double-bass slamming line from drummer Ben Turk as Winkler sings about soaring on the wings of metal dragons. It’s the perfect way to lead this silly, yet oddly compelling story into its final chapter, “Apocalypse 1992,” the requisite 10-minute, uber-dramatic finale. First Christopher Bowes, in the character of Zargothrax, sets the scene of the final battle in a spoken word piece, then he and Winkler go back and forth leading to another huge soaring chorus with a nice chuckle-inducing touch at the end as “1992” is delivered in an antiquated robot voice. It’s great fun, but also a very impressive example of its genre. But Gloryhammer can’t resist one final shot at the excesses of the power metal genre with the fadeout “Dundax Aeterna,” a superfluous ending track that just features spacey swells of Bowes’ keyboards. Much like his first band Alestorm, Bowes’ second band doesn’t take itself too seriously when it comes to themes. The music, however, Gloryhammer takes very seriously. At the end of this album, like almost everything that Christopher Bowes delivers, I’m left with a big goofy grin on my face, waving my imaginary sword in the air and singing the chorus of “Goblin King of the Darkstorm Galaxy” at the top of my lungs. What more can I ask for?